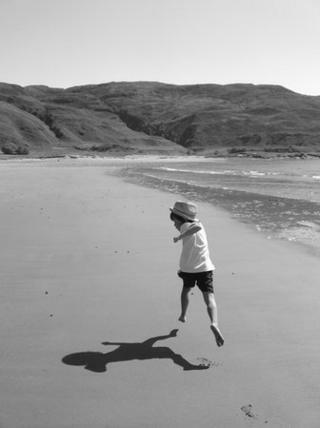 A beautiful picture of a child running across the beach has won the top award in the 50th birthday photography competition of the National Autistic Society. The picture was taken by Melanie Garside and shows her seven-year-old son Dewi who was diagnosed with autism at the age of three. "For me, the photo shows how Dewi can find such joy in his own company, by making a friend out of his shadow," says Melanie. "He's a really happy little chap, he just loves nature, bugs, beaches and exploring the wilds alongside his shadow. "What you don't see in the picture is that behind the camera, the rest of the family are all together, playing a big game of cricket. Dewi isn't taking part as his autism means he can find group activities or being around others difficult. "This picture makes me so proud of him. It was Dewi's way of capitalising on our island idyll. There are no footprints in the photo - it's just Dewi in flight, at peace with himself. "What Dewi knows though is that there is a whole family who love him there, right behind him, watching his back. "Friendships can be hard for many people with autism. What amazes me is Dewi's ability to do what so many others in our world can find so difficult - his ability to find a friend in himself." Another picture that was selected from the shortlist, this time in a public vote, was a delightful photograph titled, Mr Elephant and James. Yet again it was taken on the beach, a place of wonder for all children, by James' mum, Annie Elliott. "This is a photo that encapsulates one of the most extraordinary friendships I have ever seen," says Annie. "James struggles with children his age and usually prefers to be on his own. He has trouble relating to the world around him and can be quite fearful of unfamiliar places. "That's why it was such a huge surprise when we were out one day shopping and he just lunged out to grab Mr Elephant from the shelf. Ever since that day, they have been inseparable. Mr Elephant has become not only James' best friend, but also his guide to the world. If Mr Elephant goes somewhere that James fears, James is more likely to follow suit. James won't hold hands with people, so Mr Elephant can go in the middle to connect James with other people in his world." "The day this photo was taken was the first time we had ever managed to take James to the beach - in the past he'd just been too nervous. But this time, we had Mr Elephant on our side. We spent a whole two hours in the sun and it was just the most joyous family day. Now, when I look back at this photo, I see nothing but contentment between two best friends. "This picture itself even has its own part to play in the story. Since we took it, James has used the picture to learn how to say his own name and looking back at the picture, far from fearing a trip to the seaside, he can't wait to go again." The competition shows how photography can be used to do far more than simply record a moment. "Judging this photo competition gave us an incredibly valuable glimpse of some of those special experiences and unique moments in time that mean so much to families whose lives are touched by autism," says photographer John Swannell, one of the judges. "I was delighted by the real feeling of positivity and hope that shone through in so many of the entries." Another judge, Jay Blue, an amateur photographer and autistic writer and poet adds, "I am really pleased that so many of the entries in this competition challenged some of the common misconceptions that go with autism. These photos will strike a chord with so many people whose lives are touched by autism. The entries illustrate emotion, friendship, joy and, ultimately, humanity, it its many guises." Here are some more of the pictures that were short listed for the award. Image caption Melodie Blake: "This is a picture of my youngest son Jay with his cousin Kobi and Amy. They are the beautiful best friends of my son Kai, who has autism. This was taken one sunny January day when we were out on the downs but Kai actually isn't in the photo - he's running around somewhere just off camera. It's one of the places that he feels free, and he loves to run, so we take him there a lot." Image caption Susan Child: "Clarice is the only one of our children who hasn't got any medical complications. But, living with two brothers with autism can be hard on her too. She can't do 'normal' things like have friends over for tea, we don't really go on days out and we've never been able to take the kids through the upheaval of a family holiday. Siblings of children with autism can often be forgotten. This photo shows Clarice's own struggle, and her beautiful, dignified way of finding solace." Image caption Nicola Brooke: "This photograph captures a really special moment for my family. For me, it shows that age is no barrier to friendship. I can get quite emotional looking at the photo. Lellys was a wonderful lady and she always went the extra mile during the festive season - we called her the Queen of Christmas. Since grandma passed away, I've put the photo up in our kitchen and look at it every day." Image caption Fleur Scholey: "For me this photo says that despite autism, you should never underestimate your children, ever. You do start to self-doubt and think things won't progress or change, but look at these two friends, singing in the rain. Absolutely amazing kids."